Popular culture would have us believe that bones are synonymous with happy dogs. Bones are printed on doggy bedding and collars, name tags are bone-shaped , toys are mock bones and even doggy treats, which are anything but bones, are fashioned into bones! But talk about dog’s bones with any pet owner and you will hear horror stories, usually involving long vet’s visits and big bills, of broken teeth, bones stuck in the throat, sharp bone splinters causing injury in the stomach and intestine and even compacted bowels. The other side of the story is that bones offer entertainment for our dogs, sinewy bones clean their teeth and as part of their diet bones are a source of calcium. So when I switched Storm and Zoe over to a raw food diet I was confused about the role of bones. When Pippa joined the family it became even more of an issue because she ate with difficulty and her teeth were really in a poor state. The question I asked myself was: if bones are such a risk, should I feed them to our dogs? It was worth investigating. Bones can be divided into 2 broad categories: recreational bones for chewing on for fun and “soft” bones that are eaten as part of the daily food portion. Recreational bones are big bones that are bigger than your dog’s mouth, so that they cannot swallow them. One site even says bones bigger than the dog’s head – must be a prehistoric site, that one! Big whole meaty marrow bones, shoulder bones and knucklebones fall into this category. Dogs can chew on these bones sinking their entire tooth into the meat and sinew, right up to the gum line, cleaning teeth and “flossing” between the teeth as well. Because these bones are so large a Schnauzer sized dog should not be able to break the leg bone but will be able to chew off the meat and softer knuckle cartilage at either end before the bone is removed. Pre-cut marrow bones and leg bones where the knuckles have been cut off and the meat stripped off by the butcher are not a good idea because just the hard bone with very little meat and sinew is left and these can result in broken teeth. It is also worth mentioning that any bone that has been left outside will have dried out and have become hard and will be a risk to teeth. Once the bone has been reduced in size that it can be swallowed or is breaking up into chunks that could potentially be swallowed they must be taken away and discarded. From this you will deduce that giving your dog a bone also means they need supervision during that time. I like to give my dogs recreational bones once a month while they are pottering around with me in the garden where I can keep an eye on them and the plants at the same time. The other type of bone is the “softer” meal bone. These bones are eaten as part of the daily portion of food and add roughage and calcium to the dog’s diet. These are bones like fresh raw chicken wings, backs and necks (not thighs or drumsticks); meaty lamb or beef ribs and, some say, even oxtail. The theory is that the correct proportion of meat and raw bone once chewed forms a “package” that is easily and safely swallowed without harming the throat or the intestines. I have found the rib bones a particular favourite because the interesting shapes of the bones hold lots of meat and sinew and keep the dogs chewing for ages. What I have experienced with Storm, Zoe and Pippa is that too many bones leads to constipation. The correct percentage of bone in a meal is just 10% and because bones are heavier than meat and vegetables it is very easy to give a greater portion relative to the meat and vegetables. What works for them is adding bones to their meal once or twice a week as a bit of variety. Something else I noticed is that very fatty bones lead to very loose stools, which are no joke if you have to “poop scoop” on a walk! So, for obvious, gag inducing reasons, I make sure the bones I buy are relatively lean. This also reduces the risk of pancreatitis, which Schnauzers are prone to. There are a few online raw pet food sites that sell suitable bones, a friendly butcher would be able to sell you the right type of bone over the counter and for those lucky few that have game hunters in the family twist their arms for a venison bone or 2. So, there are good bones just as there are bad and ugly bones but the final question is: are bones necessary? Must I feed my dogs bones? As I understand it after all my reading, the answer is a truly South African Ja Nee. Ja (yes) you can safely give your dogs the right type of bones for their chewing pleasure but, Nee (no) it is not necessary provided you are feeding a high quality food. 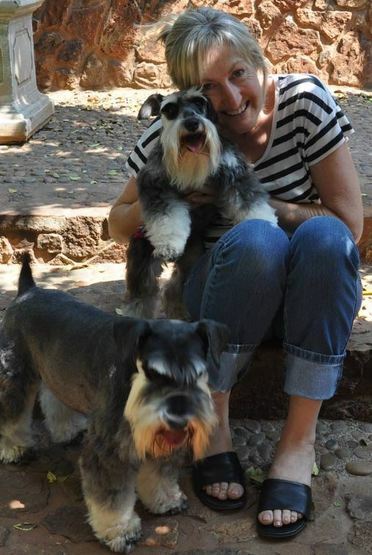 ​For me, personally, there is so much joy watching my three Schnauzies happily gnawing their bones on the lawn that I have chosen to feed bones with their raw food. I think I might agree with the popular thinking: a happy dog is a dog with a juicy bone!